Six months ago Abelardo and Juan Pablo decided to go into a new venture that would bring something new to Mexicali while making sure entire families could enjoy their time. 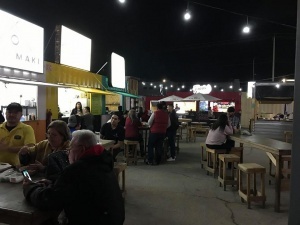 La Estacion Food Park is a brand new place located at Via Serrada del Sol in Mexicali. As you go in you can see rustic-made tables surrounded by local food vendors that will sell a variety of food going from pizza, Arab food, crepes, sandwiches, ramen soups, among other unique style foods. For kids, La Estacion has a video game place where they can have a good time as well as a batting practice area. Their hours of operation are Monday to Thursday from 3 pm to 10 pm, Friday and Saturday until 11 p.m. and Sunday they close at 10 p.m.